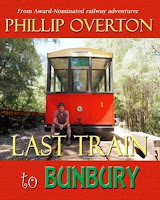 It has taken over twelve months for me to finally be able to announce the release of the third book in my latest series, Last Train to Bunbury. 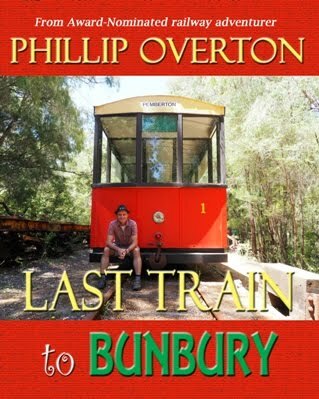 Another Aussie bush poetry romp set against the backdrop of some brilliant full colour railway photography, this book takes in the far south west corner of Western Australia and is the result of my spending the summer of 2017/2018 in the Margaret River Region. Having never been to the other side of the country before, the book took twelve months careful planning to make it coincide with my wife Denise and I celebrating our 25th wedding anniversary early in 2018. 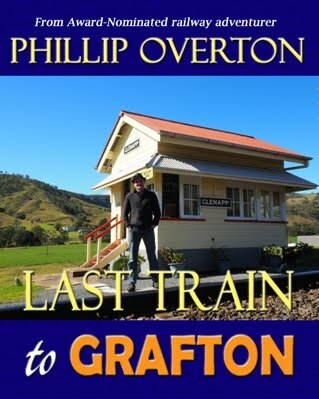 Finally, a further twelve months later, those memories of driving through tall Karri forests and bouncing down dusty red dirt tracks in a little rental car to photograph some long forgotten railway stations, can rest safely within the covers and find a place to reside on my bookshelf. Without a doubt, this will go down as the most expensive book project I have produced to date! Which brings me to a spot of good news. 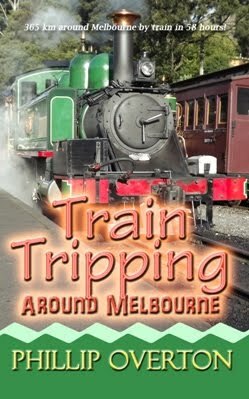 After much procrastinating, gnashing of teeth and general frustration at how slow these books have been selling, I have now reviewed enough material and photographs taken from my last sojourn south to the Victorian border to decide that a fourth and final installment will follow in 2020. Why 2020? Well, the bad news is that while making my way across outback New South Wales in 2018 to photograph some obscure and out-of-the-way relics from our railway past, I failed to obtain even one suitable photo with yours truly wearing the trusted black hat that has become a staple of my railway adventures so far. So you guessed it, I now have to plan another sojourn south to the Murray River to capture the photo for the cover, and that journey won't happen before mid 2020. Last Train to Sydney will be my fourth and final railway bush poetry book, so expect to see me taking a bow on the cover. 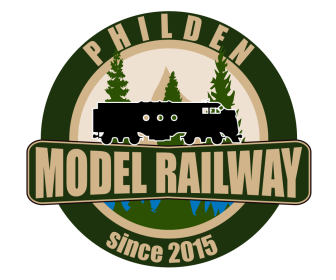 Finally, after a much quieter 2018/2019, I will be ready to make a big announcement after attending this year's Brisbane Model Train Show at the Brisbane Showgrounds over Sat 4th & Sun 5th May 2019. What is it? Well you'll just have to bookmark this page and come back then to see. 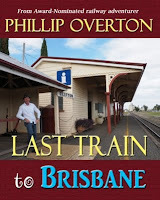 Last Train to Bunbury is available now through the following channels, along with the first two installments in this series at the special introductory price of $24.99 AUD (+gst and postage). Unfortunately prices for these books will have to be revised later this year. So by ordering now you'll be sure to get the first three books at a much cheaper price! It's been a long year, and we're not even done yet. It only seems like the other day that my wife Denise and I were on the other side of Australia to see in the New Year, and now its September and the football season is suddenly coming to an end. It's made me stop and think of the term 'season'. Everything has a season, and every season has its turn. When it comes to drawing the metaphor between seasons and a book series, it's taken a rather ordinary year to realise when an extraordinary series has had its time. Let me elaborate. 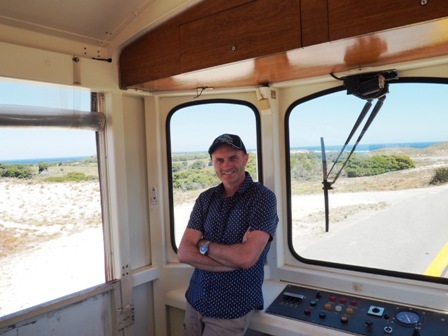 After smiling for the photo by the driver's control stand aboard the Oliver Hill Railway on Rottnest Island off the coast of Fremantle in Western Australia, I headed off the next day for a week by the ocean near Margaret River to celebrate my wife 'putting up with me' for 25 years of marriage. 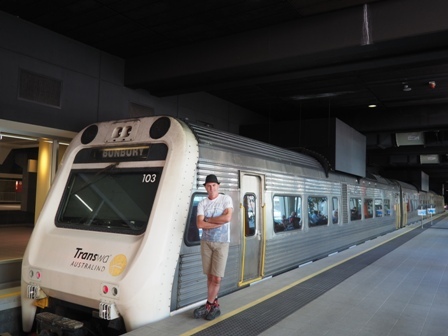 We took the Australind train from Perth to Bunbury, hired a car, and spent the next week exploring the caves, wineries and even sought out some old railway stations to photograph for a future book. Three nights in Perth and the trip south to Bunbury had also given me enough material to put together another train tripping adventure. Ready to depart Perth for Bunbury in the heat of an Australian summer! Fast forward to July, and work on a fifth Train Tripping instalment hadn't progressed beyond the notes scribbled in my notebook. The same notebook that contained all the notes I had jotted down from my adventures by train around South East Queensland for another instalment in the series. Denise and I found ourselves heading south on short notice to visit her mother in country Victoria in the dead of winter. True to form, I somehow managed to find my way onto a train, and let me tell you... Shepparton at 6.28 am in the middle of a frigid winter's morning is a damn long way from the sunshine of Margaret River in the summertime! Alone on a frigid winter's morning in Victoria, about to board another train. Despite the first hour of the journey south to Melbourne being in total darkness, with notebook in hand I started scribbling my usual observations in the remaining few blank pages. Travelling in the darkness had its downside however. With nothing to see out of the window between the lights of slumbering country towns, I started looking through my notes from Perth and Bunbury, along with my trips around Brisbane and the Gold and Sunshine Coasts. Notes... fun facts... figures. Yet nothing that captivated me quite like the journey itself. 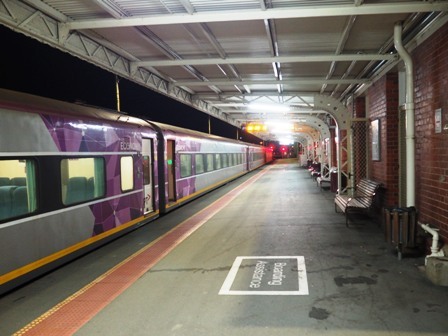 In fact, the diesel locomotive hauled service from Shepparton that I was riding aboard was yet another example of a train that is slated to undergo change, with the ever popular Vlocity diesel multiple unit train sets set to replace it within the next 12 months. 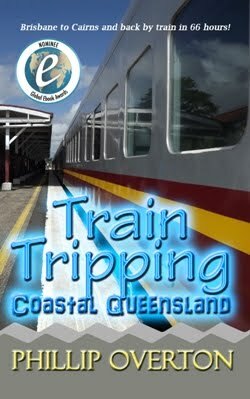 Just as happened to The Sunlander train that I rode on when I set out to write my first book in the series Train Tripping Coastal Queensland, changes were taking place around me faster than I could complete the next book in my series. 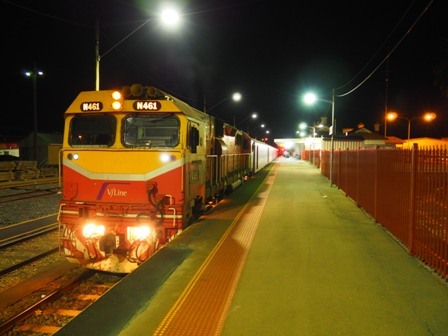 The 6.28 am from Shepparton, about to depart in 2 degree temperatures! I put my notebook away. Instead of taking any further notes, I went to the buffet car, bought myself a cappuccino and simply sat back and enjoyed the trip. Who knows when will be the next time that I get to ride a train in Victoria, and it most likely won't be behind the gentle rumble of a locomotive. By the time I'd returned back to Shepparton later that day, I knew there was little chance of me adding any further instalments to my Train Tripping series. After a year that has gnawed away at my time and creative endeavours, the train journeys that I have made over these past 12 months hardly seem worth the effort of fashioning into another instalment. Not when the trains in question are all in the process of being reviewed or updated with newer rollingstock. Tying any further books to a series that was written between 2014-2015 was only going to call for a re-write and re-release of the original books. The logical answer was to leave a good series be, and put aside all the new material I have collected for a new project with a different formula. I'll always remember the first of these four books for earning me a nomination in the 2015 Global eBook of The Year Awards. As a 99 cent eBook, it at least proved to be cannon-fodder against the highly successful Lonely Planet travel guide books. But all four were mildly successful when it came to sales, and at times topped their bestseller categories on Smashwords. I made the decision to re-release them all in print over the course of 2017, when really I should have just let them be. At 99 cents they sold. At $7.99 in black and white print, even with the added inclusion of photos, they don't. But hey, even though their moment in the sun has passed, at least I have some cool-looking train books to place on my bookshelf. It's funny how these realisations just seem to hit you at the right time. Instead of throwing myself into writing the three follow-up instalments as I had planned to, I now feel as though a huge weight has been lifted from my shoulders. I'm suddenly free to hit-up another project. There's a few ideas already ticking over in my head that involve me finishing my railway-themed books on a high, but I can now finally sit down knowing that I'm free to do whatever I choose to with all this other great material that's just sitting there. 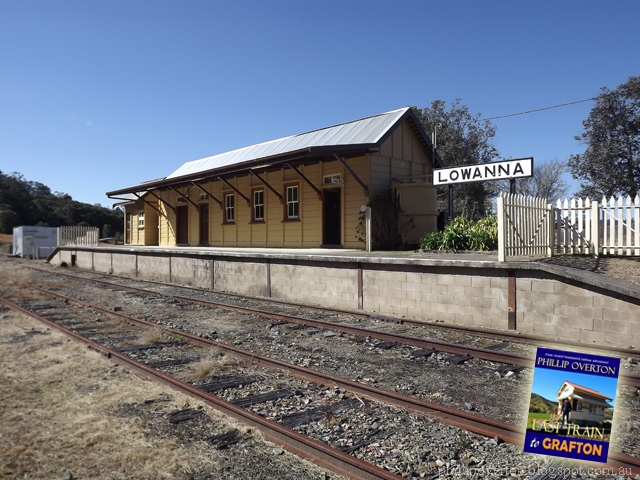 Beautifully restored Lowanna Railway Station, high in the hills on the old Dorrigo Line. For the final look inside my book Last Train to Grafton, I've included this photo from up in the hills of the New South Wales North Coast. Lowanna Railway Station, (located between the former North Coast Line junction station of Glenreagh and the mountain terminus of Dorrigo), is one of those beautifully restored former railway stations that you rarely come across anymore. Sitting in its original location, tucked away from the world in the hills northwest of Coffs Harbour, this stunning railway station owes its condition to the volunteers of the Glenreagh Mountain Railway. Despite plans to restore the entire line to operating condition repeatedly running into trouble, the station inspired me to write the poem 'Trains that never come' to accompany the many full colour photos featured in Last Train to Grafton. Next up, I will begin sharing some of the stunning images I collected while back-tracking my way through southwest Western Australia over the summer of 2017/2018 from my forthcoming book Last Train to Bunbury, due later this year. And fingers crossed, there may just be a fourth and final Last Train instalment to follow close behind it. Stay tuned! This surviving little station building in the middle of nowhere is at Ulong, on the old Dorrigo branchline. Tucked away in the hills of the Orara Valley on the New South Wales north coast, you'll find the abandoned branch line that once climbed west to the town of Dorrigo. Closed in 1972, the Dorrigo branch today has succumbed to the advances of nature, with many sections of the 1924 railway line completely covered by overgrowth. Halfway up the mountain at the tiny town of Ulong, (population just 131), the still standing station building lies hidden off a narrow, dusty road that is skirted by a string of rusting railway wagons, some with trees growing up between them. Although an almost impossible former railway station to find, the sight was enough to inspire the poem Too long in Ulong in my book Last Train to Grafton. 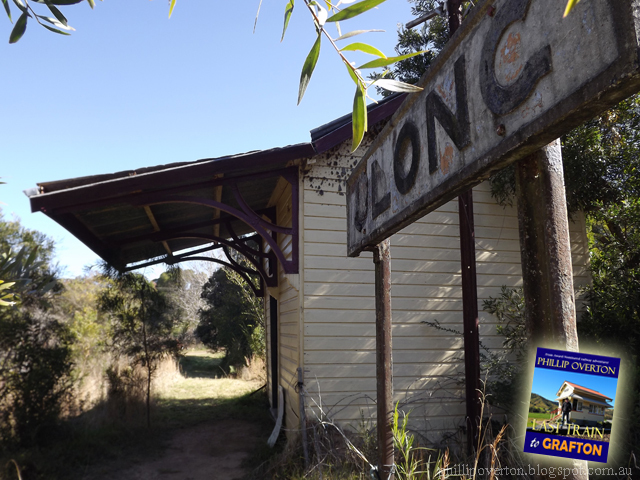 Part poetry, part photographic journey through our disappearing railway past, Ulong was just one of the many abandoned railway stations I explored between the Queensland border and the mountain town of Dorrigo. Everything has a use-by date. I know I've opened a blog post with this line before, but its only as we grow older that we begin to pay more attention to the things around us that come to an end. It usually starts with a long running TV show that airs its' final episode or a favourite footballer who hangs up the boots, but the older we get the longer the list becomes. We'll get surprised when our favourite restaurant closes down, shocked when our favourite products become unavailable and disillusioned when a favourite place that we visit doesn't live up to the memories they once held. Somewhere along the way we'll lose hair, money or even the drive that has kept us going all those years, and before too long we start referring to the past as the good old days. That's life. And no matter what kind or work we do, brand of clothes we wear or car we drive, everything has a use-by date. If you're an artist, athlete or even a less-recognised writer such as myself, what you do now is not going to be what you do forever. Eventually every footballer will take his last kick, every race car driver will turn the engine off for the final time and every actor take his or her last bow. Sometimes, due to injury or contractual disagreements and the like, that moment happens without warning. Lately however I've been noticing a growing trend of athletes announcing their retirement before the start of a season, with the statement of wanting to go out a winner. Their fans rally behind them and the season becomes a glorious swansong, that win or lose, hopefully still ends on a positive note rather than being stretchered from the field for the final time. So why don't actors, singers or writers follow suit? Probably because in each instance, you are only as good as your next album, movie or book. A flop can usually signal game over, while a smash-hit always brings the temptation for 'just one more.' I've never heard of a writer pre-announcing that their next book will be their last. Art works entirely different to sport. Everyone is looking for the next 'insert name here,' who is like them only different. Different gets attention, and attention sells. The problem with different however, is that different has a short shelf life. Perhaps that is why I find myself drawing less and less inspiration from these people, and instead pay a little more attention to the heroics on a football field. 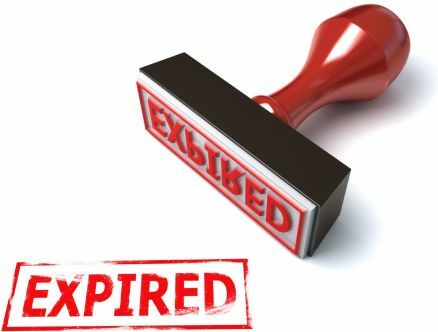 Name any singer, actor or actress from the recent past who was a little too different, and I can guarantee you that their fifteen minutes of fame has long expired. Fame too has an expiry date. While an athlete's body remains the best indicator of knowing when to call time on their career, it is more likely that an actor, musician or writer's curtain call follows closely behind a stinker. Yet that doesn't have to be the case. After seeing my own writing come full circle to where I was ten years ago, I came up with these five simple questions to put to myself. I'm sure you could substitute the word 'this' with any career or profession, from goal-kicker to project manager to extract an honest answer from yourself. Will not doing this anymore be something I can live without? Is continuing with this beginning to cause me anxiety? Am I already looking forward to doing something else when this is over? Are there more genuine things other than this that deserve my time and money? Am I able to look back on this with a sense of pride? If you answered yes to all of the above five questions, then you guessed it. You should probably be planning to do something else. Of course there are sometimes other tangibles that may indicate your career is coming to an end. The Train Tripping books that I first started writing back in 2014 now have other factors dictating that their shelf-life is fast approaching an expiration date. With a budget of zero, my self-published railway guide adventures have taken me on board everyday trains around Australia, from the humble XPT to the 7:20 am to Warrnambool. While money and a lack of sponsorship ruled out adding any Trans-continental epic adventures to my series, some of the trains featured in my books are now in the process of being replaced by newer versions commencing in 2020. This in turn makes the trains that I have written about (and quite possibly my books) obsolete in about two years time. Then there are my Last Train books. Instead of getting excited that my self-produced fusion of railway photography and Australian bush poetry was something fresh and new, I've had the sense to sit back and see my work for what it is. Different. Good different? Yes. But in such a niche genre of writing as to make it impossible to even command those fifteen minutes of fame. With my next book almost complete, my thoughts are already wrestling with whether to continue the series. Photographing old and abandoned railway stations becomes increasingly harder with each passing year. More and more decaying structures are being demolished due to government health and safety concerns, and preservation groups and government bodies can make it nearly impossible to gain permission to legally use the images in a commercial sense. The research required, coupled with the expense of travelling great distances, (such as flying to the other side of Australia and spending the best part of two weeks bouncing down dusty roads in a rental car to collect the necessary photos), makes the thought of another of these books prohibitive. Perhaps a more positive approach would be to plan one final hurrah, and make it a good one! Instead of feeling ripped-off that I didn't have the time or budget to cover more adventures, I'm taking it as a positive that I at least get the opportunity to decide how I want to finish with one last great adventure. Back in October 2016, I wrote my 100th and final railway reminiscing post on this blog, and began with the words everything has a use-by date. It's strange how your own words can come sometimes come back to haunt you. For myself, writing about my love of trains was only ever intended to be a short diversion from my writing fiction. Beyond writing that last great railway adventure however, the fire is no longer there. I can live without it. The thought of putting myself out there again causes me anxiety. I'm already enjoying interests other than writing, and there are a million other things more deserving of my time and money. Strangely the drive is now about finishing what I've started, and ending a career positively. I guess that will be the moment I can answer question 5 with a yes, and look back on it all with a sense of pride. No sour grapes, no hard-luck writer's stories, and no regrets. Not being able to forge a full-time writing career hasn't been through lack of trying. Take a look back through this blog and you'll see just how far and wide I travelled promoting my novels, back in the good old days. We live in a world of talented people. There are more writers, actors, musicians and artists living around us now than when I was I kid. Good grief, it stands to reason that not everyone is going to make it to the top when most can't even get a foot in the door. But even then, everything has a use-by date. Even the best of them. At the end of the day, I think its better to have tried and not got your fifteen minutes of fame, than to have not recognised when your fifteen minutes were up! So with no pressure, no self-imposed deadlines and no great expectations, I suddenly have a much clearer outlook on how I'd like to approach finishing up my railway-themed books and moving onto the next project. Whatever that may be. Now to get back to some writing. 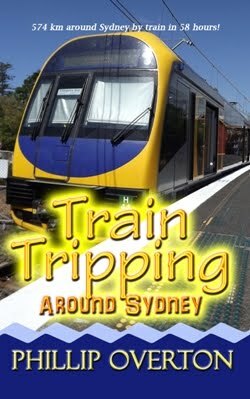 I'll let you know when my next Last Train book is coming out. See also; One Final Railway Reminisce and Is blogging still relevant?